When it comes to Thanksgiving, especially Thanksgiving desserts, I'm definitely in the more is better category. Don't get me wrong, I love a Thanksgiving pie like nobody's business but I also love cake and cookies and trifle and I think they too deserve a spot on the Thanksgiving table. Last Thanksgiving, we had a fantastic chocolate cake, fruit bars, ras malai, and no fewer than three types of pie. And after my forth plate of dessert, you know what I thought? Gosh, some pumpkin cheesecake would have really rounded out the dessert table! Needless to say, when this month's Blogger CLUE topic was revealed to be Thanksgiving desserts, I was pretty elated. Like eat-all-the-desserts elated. I rushed to my blog buddy Christy's blog and immediately thought to make her Cherry Clafoutis. But then her Cranberry Cream Cheese Bars looked so good. And don't even get me started on this fantastic looking Easter Pie. I'd just rename it Thanksgiving Pie and call it a day. If you don't know Christy, allow me to provide a bit of an introduction so you can better understand my inability to pick one dessert because everything on her blog looked so darn good. Christy is a banker by day but at night, she throws off her heels and puts on her fantastic cook slippers. She lives in Palm Springs with her husband and two adorable Havanese puppies. She is also a member of a ton of fun food blog groups. And lest I forget, she's a bit of a baking boss! So back to the Thanksgiving desserts. I finally settled on this Lemon Almond Cake, called a Ladies Who Lunch Cake and also a Maid of Honor cake because it's apparently perfect to serve at wedding showers. I wasn't hosting a shower but I love me some lemon and almond and wondered what they'd be like in one cake. 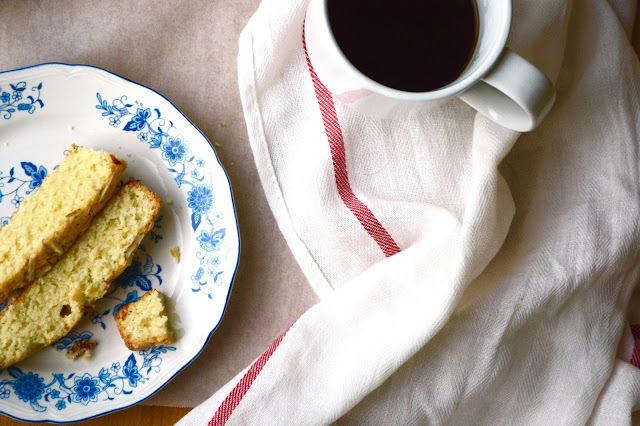 Plus, leftover cake makes a mighty fine breakfast. The verdict? Please please make this cake (although not at midnight like I did). It's got the best crumb and the lemon and almond flavors are meant to go together (much like chocolate and chocolate but wait, that's a different cake). It's the perfect star for your Thanksgiving dessert table. Or if you're in my world, it's the perfect addition to your Thanksgiving dessert table right next to the Thanksgiving pie, Thanksgiving cookies, and Thanksgiving pudding. Happy almost-Thanksgiving y'all! Grease and flour one 9-inch round cake pan, line bottom with parchment paper. Place almonds, flour, salt, baking powder, and baking soda in food processor and pulse until almonds are finely ground, 5 to 10 pulses. Transfer the almond-flour mixture to a bowl. Place eggs, 1 1/4 cup sugar, 1 1/2 tablespoon lemon zest, and almond extract in the now empty food process and process for 2 minutes. While the food processor is running, add the butter and then add the vegetable oil in a steady stream. Once processing is finished, add the almond-flour mixture and pulse 4 or 5 times until the mixture is fully combined. Transfer the resulting batter to the prepared pan. Using fingers, combine in a bowl the remaining 2 tablespoons of sugar and remaining 1/2 teaspoon of lemon zest until fragrant (approximately 5-10 seconds). Sprinkle this sugar mixture evenly on top of unbaked cake batter and then sprinkle on the remaining 1/4 cup almonds. Bake approximately 55 to 65 minutes, until center of cake is set and bounces back when gently pressed and toothpick inserted in the center comes out clean. Pan should be rotated 180 degrees after 40 minutes. Transfer pan to the wire rack and let cool for 10 minutes. After 10 minutes, run a paring knife around the sides of pan to loosen. Remove cake from pan, remove and discard the parchment, and let cake cool completely on the rack for approximately 2 hours. Cut into wedges and serve. * Note I halved this recipe and baked it in a loaf pan at 350 degrees for 25 minutes and it came out perfectly. I would've preferred the larger, round cake but my pants disagree. Ooh, this combination sounds amazing! I'd even justify eating a slice of this yummy cake for breakfast! Ras Malai on Thanksgiving? I love it. Do you also do a tandoori turkey? I've always wondered how that would taste. 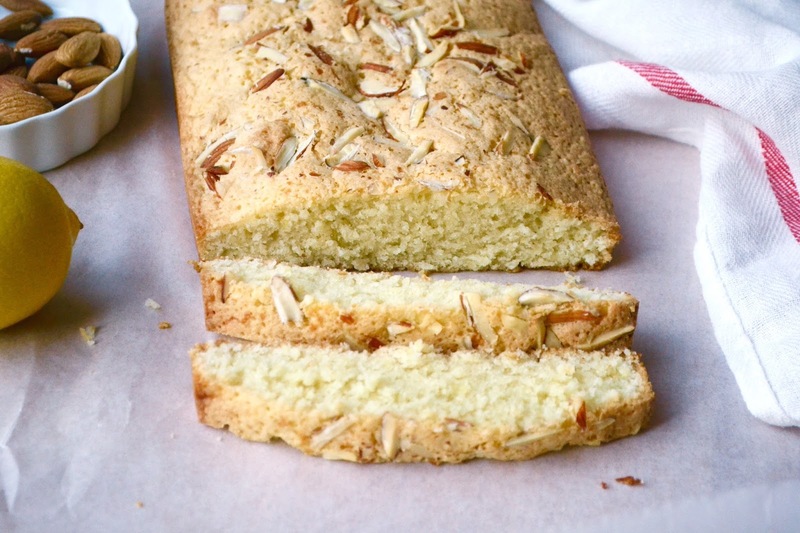 A lemon almond cake is a perfect recipe for my family. Love it! A nice twist to the Thanksgiving table. Mmmm....do I have to wait for dinner to have a piece? I think breakfast is the perfect meal for a slice of this delicious cake! 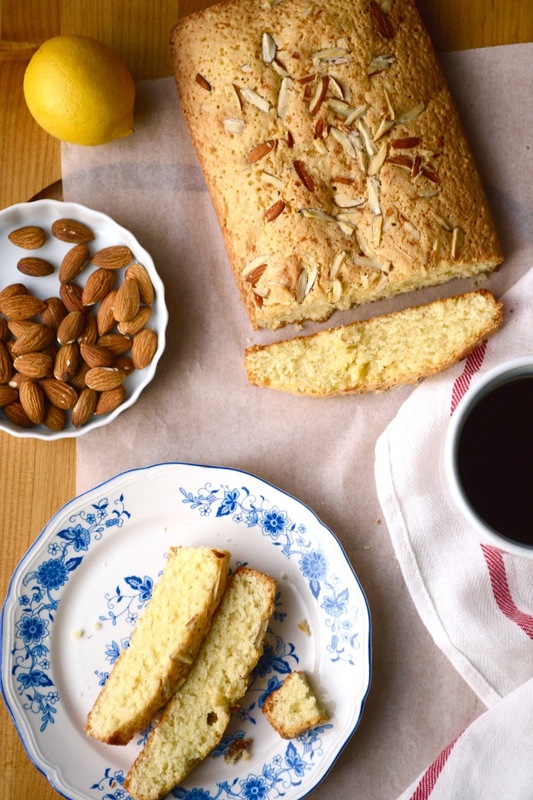 Oooh I adore this combo of lemon and almonds - the aroma, the taste, the flavor - fantabulous! Don't you always bake at midnight??? :) I love the lemon and almond combination too so I'm so happy that you chose this recipe. I'll have to give it a go. I occasionally have a good midnight baking session, but not lately! Sure glad the bounty turned out as beautiful as this did, makes it all totally worth it! Oh my goodness - this is one TASTY dessert! I bet it did not last long at your house! Can't wait to see you at the cookie exchange! You had me at the title of this recipe. I love lemon and almonds. Mine would have a special place on a holiday breakfast buffet. I love any kind of almond cake and this type of tea cake that's so satisfying but light at the same time. It is a great selection for Thanksgiving dessert and the kind my extended family would love (since they are not as insane over chocolate as I am). I need to try lemon with almonds more...I'm always thinking more along the lines of orange zest. Oooh this would be awesome for a brunch before the big meal, too! Lovely choice! Yumm. When I first saw the photo, I thought this cake was biscotti. I wonder if you could bake it in that traditional as well? Great recipe! I love lemon loaf! I like the idea of the almonds on this! I love the way you think!! Peter is into his pumpkin and apple pies for holidays, but I will take all the desserts! Now this cake I could see myself chowing down on for breakfast, lunch, and dinner (and possibly midnight, too ;) ). Beautiful photography, too! Haha, I hear you. The more the desserts on Thanksgiving, the better. I absolutely adore almond flavored anything and this definitely would be awesome on any table. Great cake.